The problem of a missing table leaf can be resolved in several different ways, extending the useful life of the table and allowing for expansion for family dinners or holiday gatherings. Whether your dining table leaves were lost, damaged or discarded, or your table was purchased secondhand without them, figuring out how to expand seating for special occasions can quickly become a priority. Fortunately, there are several options available when it comes to replacing leaves. If your table was created by a well-known manufacturer that is still in business, you may be able to obtain new leaves that are identical to the missing ones. You can check underneath the tabletop for a stamp or label from the manufacturer, but in the case of antique tables, the original manufacturer may have shut down, changed its name or been sold to another company. You can do some detective work or look online for similar tables in an attempt to track down a potential supplier. Another option is to purchase premade table leaves or blanks from a furniture restorer. Some restorers can match the new table leaves' wood and finish to your existing table and may even be able to age the finish to match the table's current appearance. 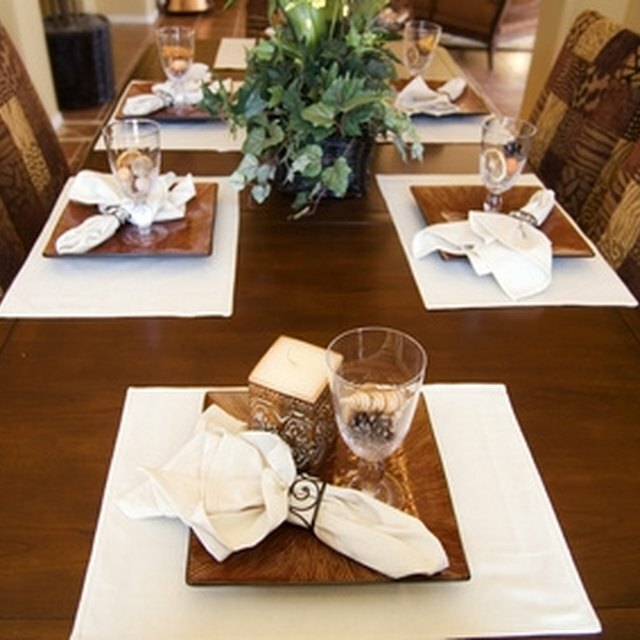 Other companies may sell table leaf blanks that are simply used to fill the gap and are designed to be covered with a table pad and tablecloth. You may be able to find leaves that are a close enough match at a local antique shop or flea market. Most table leaves come in 12 or 18 inch widths, and the length will match the diameter of the table. Measure the width, length, and thickness of your existing tabletop and look for leaves that are a close match. Many tables are similar enough in size that an old leaf from another table will work. It's even possible you could luck out and find a leaf that is almost identical to the original. You can also try a DIY approach. Cut boards to the correct width and length, glue multiple layers together to achieve the correct thickness if necessary and sand the edges for a smooth fit. If the table has a beveled rim, you can use a small hand tool such as a block plane in an attempt to approximately match the correct slope of the table edge. The original leaf will likely have been held in place by a system of pre-drilled holes and matching dowel pins in both sides of the leaf and the existing tabletop. Check the positioning and size of these pegs and holes on either side of the open tabletop. Drill holes and install pegs of corresponding shape and size at the appropriate places on the new leaf. Use a small amount of wood glue to hold pegs in place. Cover it with a table pad and cloth when using the table, and no one will be the wiser. Stain and varnish or cover your new leaf with self-adhesive wood grain paper or cork. Add side facings to the new leaf to match your tabletop by cutting 12-inch sections of 1-by-4 and attaching them to the tabletop with woodblocks. Sand the bottom edges carefully so that diners don’t catch clothes or, worse, pick up splinters. Always use eye protection when operating power tools such as a circular saw. Houzz: I just DIY'd a new dining table leaf for $12 and 45 minutes! !